Lapland Lake Nordic Vacation Center will host its two-day annual Open House Saturday and Sunday, November 21 and 22 from 9:00am – 4:30pm each day. During the two-day Open House all in-stock merchandise, which includes ski equipment, apparel, specialty foods and gifts, is 10 – 60% off. Season-long ski equipment rentals ($80 – $180 plus deposit) will be available. Receive expert advice from our staff including resort founder and former U.S. Olympian Olavi Hirvonen. Lapland Lake Season Pass Memberships will be available at normally reduced early-season rates; regular Membership rates will go into effect Tuesday, December 1st. At 11:30am and 2pm each day Pat Ferri, PSIA-certified instructor and Assistant Nordic Director, will offer free hour-long wax clinic and ski care tips sessions. All are invited! Hourly door prizes will be drawn. Attendees may visit with Lapland Lake’s pet reindeer, Viima, at his new trailside home and enjoy complimentary cookies, hot chocolate, coffee and tea at the resort’s Kuuma Feeding Station located in the Finnish Line Ski Lodge. Visitors are welcome to tour the Lodge, rental-retail shops, tupas (housekeeping cottages) and authentic Finnish sauna. Open House is free of charge. Facility use fees will be half-price both days for those wishing to ski, snowshoe and tube (conditions permitting). If there is no snow, visitors are welcome to enjoy complimentary hiking on the resort’s 50km trail system. Best XC Ski Resort in the Mid Atlantic Region and Best XC Ski Resort for Families, Best XC Ski Resort Poll; Top Ten XC Ski Resort Catering to Families, xc ski resorts.com; Adirondack Regional Tourism Council’s Private Sector Tourism Partnership Award; and Fulton County’s Tourism Partner Award. A complete cross country ski and snowshoe facility, Lapland Lake offers fully equipped rental and retail shops, a comfortable warming lodge, food service and overnight accommodations in private housekeeping cottages. The trail system has 50km of trails for all ability levels. 38km are marked, mapped and snowcat groomed with trackset and skating lanes; 12km are ungroomed, marked, mapped snowshoe trails. Cross country ski lessons are offered daily by the resort’s staff of PSIA-certified instructors. 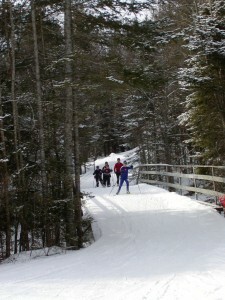 Other activities include ice-skating, tubing, sledding, kicksledding and wilderness ski touring. A full winter Calendar of Special Events is also offered. Located in the south-central Adirondacks, Lapland Lake is conveniently located just over an hour’s drive from Schenectady; 60 miles from Albany and Utica; four hours from New York City and Boston. Interested individuals may visit online at www.laplandlake.com or contact Lapland Lake for information at 518.863.4974 or vacation@laplandlake.com.